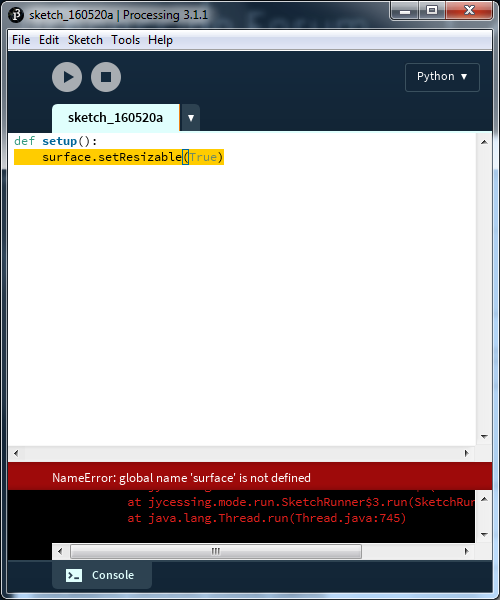 The surface thing works in java, but when I do the same thing in python, it says "global name surface is not defined." If anyone know the solution for this, please help me out! frame.setResizable(True) # use frame instead. this.surface.setSize(600, 400) # or prefix surface w/ this. this.getSurface().setTitle(`frameCount`) # or prefix getSurface() w/ this. While getSurface() returns sketch canvas' PSurface, getGraphics() returns its PGraphics. sketchFile() is similar to sketchPath(), but returns a File instead of a String. Same rule for dataFile() is related to dataPath(). Which is sketchPath + "/data". args is a String array which keeps the arguments passed to the sketch when calling it from terminal or from another program. Got it! You are such a nice guy. Thanks a lot! Thanks for the info GoToLoop! I was wondering if this works when using the PDF renderer? I'm outputting large PDF files from processing and would like to dynamically set the PDF size after I've done some calculations on the input files. I'm getting the following error when I try to include the frame.setResizable(True). I'm using Processing 3.3.6 btw. Thanks in advance for any info you might have! You can see in my 1st reply example, I can access the non-globals() member getSurface() either w/ this.getSurface() or this.surface. :ar! Also, you can import any Processing classes not yet available in globals() via from package.name import class. Finally got a chance to try this, thanks again for the knowledge GoToLoop! Well, I added this to the surface call, but the PDF output is still at the initial size set in the size command. Sorry if this is obvious, still a Processing newbie. Surface that's not really visible. Used for PDF and friends, or as a base class for other drawing surfaces. It includes the standard rendering loop. OK, it didn't seem like I could get the PDF to resize so I'm glad you came to the same result GoToLoop. Thanks again for your time and helpful info!